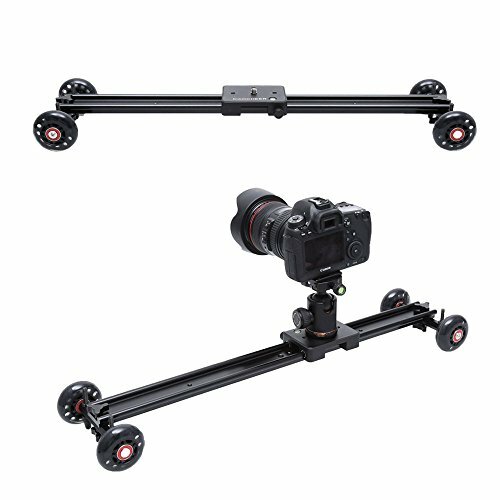 COOCHEER Camera Slider Dolly 24"/60cm comes with modern and fashion design, diversified combination and all-round move, making the shooting preciser and more stable. Perfect for YouTubers/short filmmakers who want to shoot dramatic video cinematography or slow motion moving photo. It is a necessary accessory for making better pictures and videos in different angels. Convenient for Adjustment: Multiple 1/4"" & 3/8"" screw holes on both ends and middle for multiple mounting options, The dolly track can be tripod mounted using either 1/4"" or 3/8"" threads centered under the slider. "